In the theater of the absurd, often the fool who cries the loudest gets the most attention. That appears to be the case with Umar Farouk Abdulmutallab, better known as the "Underwear Bomber," for his Christmas Day 2009 attempt to blow up a Northwest flight carrying 289 passengers from Amsterdam to Detroit. The explosive was hidden in his underwear. Authorities believe one of the reasons that the bomb did not go off was because Umar had been wearing the same undergarments for two weeks. Abdulmutallab was sentenced to four life terms plus 50 years in federal prison. The Attorney General's Office also put in place Special Administrative Measures (SAMs) designed to prevent him from either committing another terror attack or radicalizing other individuals while incarcerated. His attorneys filed a 73-page lawsuit last week challenging his conditions of confinement. He complains about the food, the prison cell, the other inmates, correctional staff, religious persecution and the fact that his conditions "prohibit him from having any communication whatsoever with more than 7.5 billion people, the vast majority of people on the planet." And the reason his lawyers think he deserves better treatment is because he has "behaved well." Let's not be fooled by his "jailwise" behavior. His conditions of confinement are neither cruel nor unusual. Similar measures have been used effectively on other convicted terrorists, including El-Sayyid Nosair, Omar Abdel Rahman and Ramzi Yousef. The measures are necessary to protect both the inmate and the public at large. They control who visits the inmate, and who the inmate talks with, including his legal counsel. In regard to attorney/client privileged communications we should remember that Lynne Stewart, the attorney for the Blind Sheik Abdel Rahman, was convicted of relaying secret messages from the sheik to members of his terrorist organization. Concerning communication with the outside world, it should be noted that El-Sayyid Nosair used both the inmate telephone system and the visitation program in Attica state prison to communicate with co-conspirators plotting to bomb the World Trade Center and other New York landmarks in 1993. Mohammed Salameh, also convicted in the 1993 bombing, was able to smuggle letters out of the Federal SuperMax Prison to Islamic terrorist Mohamed Achraf. Achraf was one of the architects in the 2004 Madrid train bombing that killed 191 people and wounded almost 2,000. Prison walls are sometimes porous and inmates have been known to use the very privileges given them to continue running criminal organizations while incarcerated. The threat is exponentially greater with incarcerated terrorists. Abdulmutallab's lawyers also claim that solitary confinement is driving him crazy. The term "solitary confinement" is often misunderstood. It conjures up visions of Alexander Dumas' The Man in the Iron Mask, or Steve McQueen's portrayal of Henri "Papillon" Charriere in the French penal colony of Devil's Island. We imagine prisoners in dark dungeons, eating cockroaches and spiders and slowly going mad. Neither is an accurate description. Solitary confinement is not social deprivation. It is a managed social setting, controlled not by the criminal, but by prison administrators following generally accepted standards. Abdulmutallab receives regular visits from correctional staff including medical and mental health professionals. The fact that Abdulmutallab is even claiming that his "constitutional rights" have been violated may come as a shocker when considering his background. He is a foreign national (Nigeria), trained by Anwar Al Awlaki, a member of a terrorist organization that has declared war on the United States and was sent to the United States for the express purpose of killing Americans. That is the description of an enemy combatant, not an ordinary criminal. 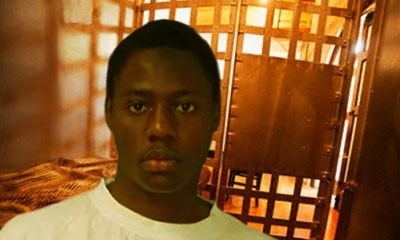 A crucial mistake occurred when a decision was made by then-Attorney General Eric Holder's Office to administer a Miranda warning to Abdulmutallab before continuing to interview him. In so doing, his status was transformed from an al-Qaida soldier to a common criminal with rights. Wasn't it his sincere religious belief that drove him to put a bomb in his underwear hoping to kill men, women and children? We should not assume that his lawsuit has no chance to succeed. John Walker Lindh, the American Taliban, filed a similar suit in 2013 and won. Lindh's exemplary behavior while in prison was a deciding factor in ruling in his favor, U.S. District Judge Jane Magnus-Stinson said. In contrast, however, it is difficult to imagine that Abdulmutalib's attempt to murder Americans constitutes sufficient contact with America for him, as a foreign national, to assert rights under American law. At some point, Department of Justice officials have to come to a consensus as to how captured foreign terrorists are classified, either enemy combatants tried under military tribunals or common criminals afforded all the protection of the constitution of the United States, the country they are trying to destroy. Until then the courts will continue to be inundated with frivolous lawsuits filed by terrorists who feel that doing time shouldn't be so hard.